The New Orleans Pharmacy Museum is a great example of the multitude of quaint and charming courtyards available for weddings in the French Quarter. This building was the location of the pharmacy of Louis J. Dufilho, Jr. in the early 1800s, who has the distinction of being the very first legitimately licensed pharmacist in the entire country. The museum features an impressive array of fascinating (and sometimes frightening!) exhibits. 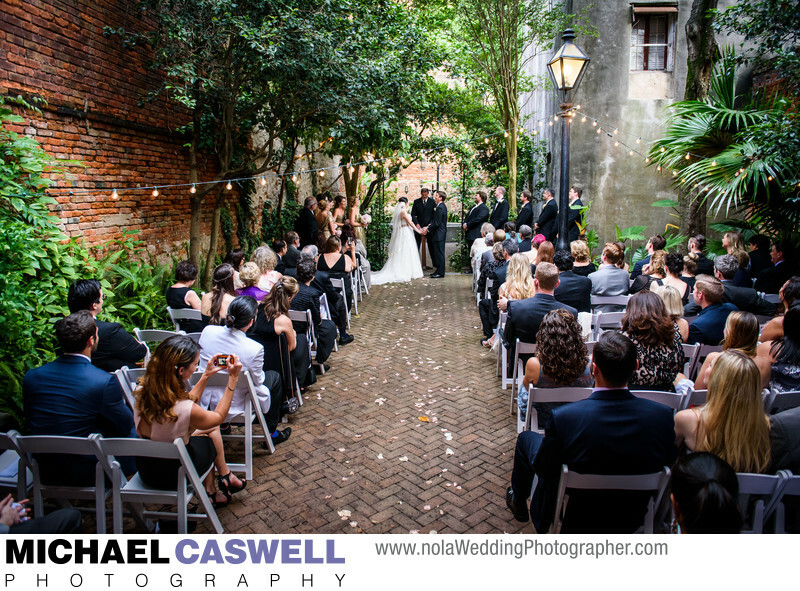 Conveniently located in the heart of the Vieux Carré near numerous popular reception venues, it's a great choice for couples a guest count of around 50-125 who are planning an indoor reception elsewhere in the French Quarter but want an outdoor courtyard ceremony. This New York bride and groom had a second line parade through the French Quarter after their ceremony, leading all the guests to Bourbon Vieux where the reception was to take place. The New Orleans Pharmacy Museum can also host wedding receptions in the courtyard, with staff quickly converting the space after the ceremony while formal group photos are being taken or during a second line parade. With its brick paving, peaceful fountain, lush greenery, and old weathered walls with tons of character, it is truly a beautiful and unique location for a wedding. Location: 514 Chartres St, New Orleans, LA 70130.